Sandwiched between Brazil and Argentina, Uruguay is stuck in between two dominant cultures and soccer teams. 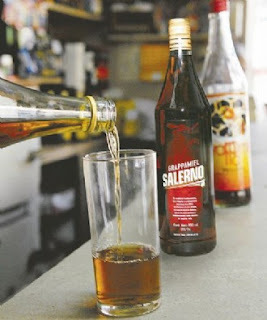 However, they are able to make a name for themselves with bites and boozes that are 100% Uruguayan. While they square off in the World Cup today against the host nation, South Africa, on the soccer pitch, we'll begin our culinary and indulgent tour with the Uruguayan version of barbeque known as asado. Much like in United States barbeque, asado can be used to mean both the method of cooking and a gathering of people to enjoy the food together. I'm not sure if it can be used as verb as well. Maybe I'll find that out one day when I visit the South American country. After the asado, we'll take a look at a traditional beverage, grappamiel! 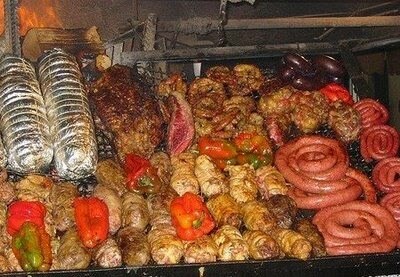 Asado, a Uruguayan version of barbeque, is as close as gets to the national dish. Uruguay's meat is rather famous, and for good reason. The conditions for raising cattle are ideal in their part of the world. History says that a Spanish explorer named Hernandarias brought around 100 head of cattle to the land that would later become Uruguay. In a matter of years they had reproduced and become a sustainable source of food for the small population. Natural land and weather conditions turned out to be ideal, as well as the lack of any kind of predators, including human populations. It is said that Uruguay's territory was populated extensively first by cattle, then by humans. Even today the country boasts that their population of cattle is greater than that of their people. Asados are social activities. Instead of charcoal, the meat is roasted by making a fire from wood, and using the red-hot embers to cook the meat. It's a time consuming process that leaves the meat with a unique flavor and amazing tenderness. While someone is preparing the fire, everyone else gets to eat snacks, and play cards ("truco" typically). It is normal to put some parmesan and provolone cheese on the grill, and to serve hot cheese as an appetizer, along with other snacks. 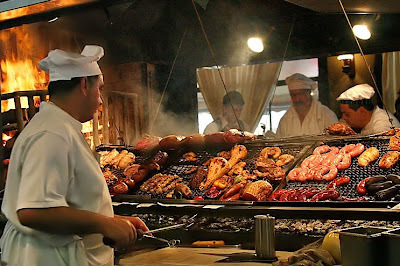 The meat (not limited to beef, just as in barbeque) is placed on a very large grill called a "parrilla,” which is designed to support considerable amount of beef, sausages ("chorizos"), and more. Typically, if the asado turns out to be good, the pit master (el asador), get's an applause from the feasters. Man, I need to cook and eat some of that! But, what about a tasty beverage to wash all that asado down? 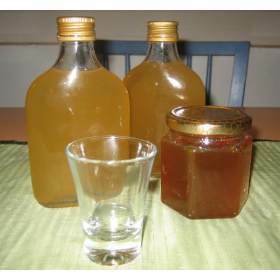 In the rural parts of Uruguay a beverage known as grappamiel is consumed often on cold autumn days or during the winter to warm the body. Similar to mead, grappamiel is made from fermented fruit (usually wine leftovers) and honey. It is based on the Italian drink known as a grappa, which is not surprising given the Italian influences in Uruguay and the grapes that are grown for wine in the region. Though the honey makes the alcohol stronger than most wines, grappamiel is still smooth and easy to sip on its own. Make sure to check out the BR Beer Scene for his thoughts on Uruguayan Beer!